Welcome to the JVNP 2.0 Update featuring a primary JV request courtesy of fellow JVNP 2.0 Partners Brad Hart (MMM), Brian + Jake Fouts (The Elevation Group) (Make More Marbles CryptoCurrency Course launch affiliate program JV invite), Buzz Builders (Aidan Booth, Steve Clayton, Chris Keef + Todd Snively – 7 Figure Cycle, Vishen Lakhiani + Christie Marie – Mindvalley – Unlimited Abundance 2018 pre-launches), and More … in Today’s conquer your FOMO on a big commission check edition. Do you want to help a lot of people, make a lot of money, and have a lot of fun? If so … keep reading. 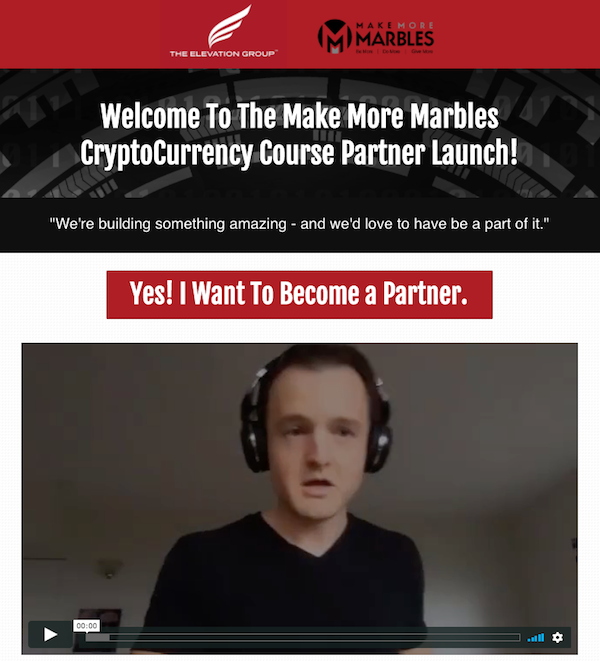 As of today, we are now accepting applications for the partner program for the Elevation Group & Make More Marbles CryptoCurrency Course. HERE is the JV partner page. As you may know, last month, we did our beta launch, and the feedback from our students has been overwhelmingly positive. Brad Hart of Make More Marbles, along with Brian, Jake & the team at EVG, have created this course as an answer to the rising tide of hyperbole, FOMO (fear of missing out) economics, and straight up misinformation being spread out there in the world of Crypto and Blockchain. We’re ALSO thrilled to announce that we’ve partnered with Mitch Miller, and his team at Opposed Media. Mitch is fresh off a seven figure launch in the crypto space only a few weeks ago, and he’s the brains behind our copy and webinar. If you have a list that this would be a good fit for (or know someone who does) you have an opportunity to earn generous referral commissions. We are ideally looking to partner with people who have lists of 10K+ in the finance, entrepreneur, investing, trading and philanthropy niches. Other partners will be considered on a case by case basis. The more people we can reach with this course, the more people will come away not only with the knowledge, but the actionable steps, rules, and frameworks for successful investing + trading in anyasset class (crypto or otherwise). Everyone who joins The CrytpoCourse will have the support they need, access to our expert network, and a clear path to success. This is deeply important to us here at EVG, because we see so many people making irrationally greedy or fearful decisions with regard to crypto. We can’t blame them for not knowing what they don’t know, we’re all guilty of this, but we can step up and help lead them down a better path. First and foremost, this is an opportunity to help people not get sucked up in hype, noise, scams or emotional decisions, which can lead to financial ruin. Once those risks are managed, they are much more likely to participate in the upside. We are committed to making our course the best it possibly can be, and into a world class resource. We’ve looked at what else is being offered in the marketplace, nothing else is even CLOSE to what we are offering at any price. Launch dates are January 29th through February 4th. Click HERE to view the partner page for more information and dates. John Pearce, Travis Stephenson and other fellow JVNotifyPro 2.0 partners are waiting in the wings … keep your eyes on your Inbox, and follow the action in the JVNP 2.0 Premium VIP JV Announcement archives.